Home > Wolfgang Product Line > Wolfgang Deep Gloss Spritz Sealant 128 oz. Free Bonus! Wolfgang Deep Gloss Spritz Sealant is a direct descendant of our ground-breaking wipe-on sealant, Wolfgang Deep Gloss Paint Sealant. The two share virtually the same blueprint, with one exception. Deep Gloss Spritz Sealant has engineered liquefied polymers that disperse easily through the spray nozzle and then cross-link on the paint surface to form one solid polymer coat over the paint finish. Wolfgang Deep Gloss Spritz Sealant's slick coating shields the paint from UV rays, airborne pollution, and road grime. 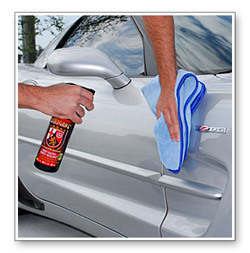 Its incredible slickness allows dirt and water to just roll off when you wash your vehicle. The paint stays cleaner longer, with fewer water spots. The multi-tiered, crystalline polymer structure of the sealant allows it to create a vivid, multi-dimensional shine that far exceeds the capabilities of ordinary sealants. The shine is comparable to what you get from a carnauba wax. Now that's shiny! And if water-beading is the true test of a quality sealant, then Deep Gloss Spritz Sealant is a proven winner! Wolfgang's exclusive formula is water-based, which is safe for the paint and safe for you. Many sealants rely on petroleum-based solvents that cause long-term damage to the paint and emit harmful fumes during application. Wolfgang Deep Gloss Spritz Sealant is safe on paint and clear coat, and it's VOC compliant. 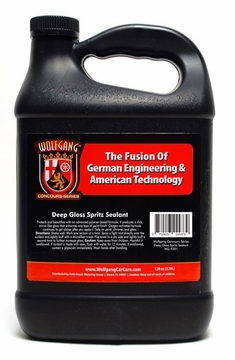 Tech note: Wolfgang Deep Gloss Spritz Sealant is oxygen-activated. Once it is applied to the paint, it requires oxygen to bond to the paint surface. Exposure to water will "drown" the sealant, preventing it from achieving its full potential. Wolfgang Deep Gloss Spritz Sealant will offer the maximum shine and protection if allowed to cure for a full 12 hours in absolutely dry conditions. We recommend applying the sealant in the late afternoon and letting it cure overnight. Once cured, the sealant will deliver outstanding slickness, gloss, and protection for months! Wolfgang Deep Gloss Spritz Sealant is a perfect match with Wolfgang Füzion. 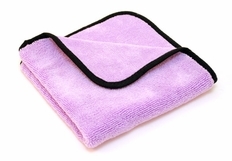 Use a dry microfiber towel to buff the section to a glassy shine. 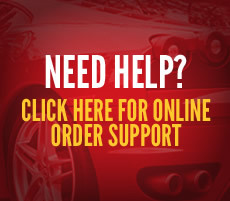 Continue in this manner until you've applied sealant to the entire vehicle.